Want to know Japanese culture? Then get to know the tea ceremony, says Midori McKeon. "It is said that without knowing the tea ceremony, it is impossible to understand the depth of Japanese culture," said McKeon, professor of foreign languages and literatures and coordinator of the Japanese Program. SF State Professor of Foreign Languages and Literature Midori McKeon. To foster that understanding, McKeon has spent the last several years bringing the Japanese tea ceremony, or chanoyu, to SF State and the broader community. She has created undergraduate and graduate courses on tea culture, holds annual tea ceremonies in the University's on-campus tea room and is coordinating an international conference on chanoyu tea cultures that SF State will host in November, the first such conference on the West Coast. The tea ceremony touches nearly every part of Japanese life, McKeon says, from food, shelter and clothing to art, architecture and literature. Some artisan skills, such as making refined utensils, may not have survived without the tea ceremony, she added. How basic is the tea ceremony to Japanese culture? There is no word for "ceremony" in Japanese, McKeon said. Chanoyu means simply "hot water with tea," reflecting its simplicity and connection with everyday life. A full ceremony can take up to four hours, although shorter ones can be completed in about 40 minutes. Guests, traditionally wearing a kimono, walk through a garden -- made of stones at SF State but ordinarily a wooden one -- remove their shoes and enter the tea room, which has been specifically constructed for the ceremony and is decorated with a scroll and flower arrangement chosen to reflect the day's theme and season. The utensils are brought into the room one by one and purified. Tea is made and served. Then the utensils are purified again and taken away. McKeon calls the ceremony "Zen meditation in action." "Watching the tea ceremony can serve to purify one's mind, leaving all personal worries, anxieties and problems outside the tea room," McKeon said. "The procedure is composed of a focused and precise series of actions and, by watching, the guests acquire the same composure, calmness and focus of the host. Everything in the tea room is arranged and prepared so that this one bowl of tea could be the most delicious tea the guests have ever tasted." The tea room was donated to the University in 1992 by a Tokyo-based company and put on display in the HSS building for one day before being dismantled and stored in the old library. When the new Humanities building opened in 1994, then-Japanese Program Coordinator Toshiko Mishima, student volunteers and community members reassembled the room, where it sat unused for a decade. When McKeon became the coordinator of the Japanese Program in 1996, she decided to take advantage of the tea room. 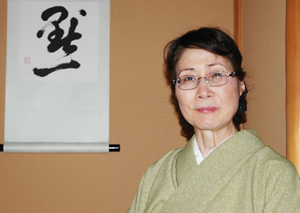 She began studying the tea ceremony in Japan in 2000 and, nearly nine years later, was certified as a tea practitioner by the Ometeseuke School of Tea in Kyoto. "To become a tea practitioner involves long, hard study," McKeon said. "Tea culture is so broad and deep that one's lifetime isn't enough to learn it all." She typically hosts a tea ceremony for students in the fall, but this year is postponing it until the spring while she prepares for next month's conference. The ceremony is an opportunity for students to clear their mind while learning something new. "To come into this tea room is a distinctly different experience from Western people's daily life and it has, I believe, therapeutic value," McKeon said. "Whoever experiences it doesn't think about anything else. They don't worry about their next exam or what they have to make for dinner that night." The experience also lines up with the University's commitment to provide a diverse education that encourages cultural awareness, she added. "Exposing oneself to another culture and its underlying values is an excellent way to become a truly internationalized person," McKeon said. To learn more about SF State's Japanese Program, visit http://japanese.sfsu.edu.